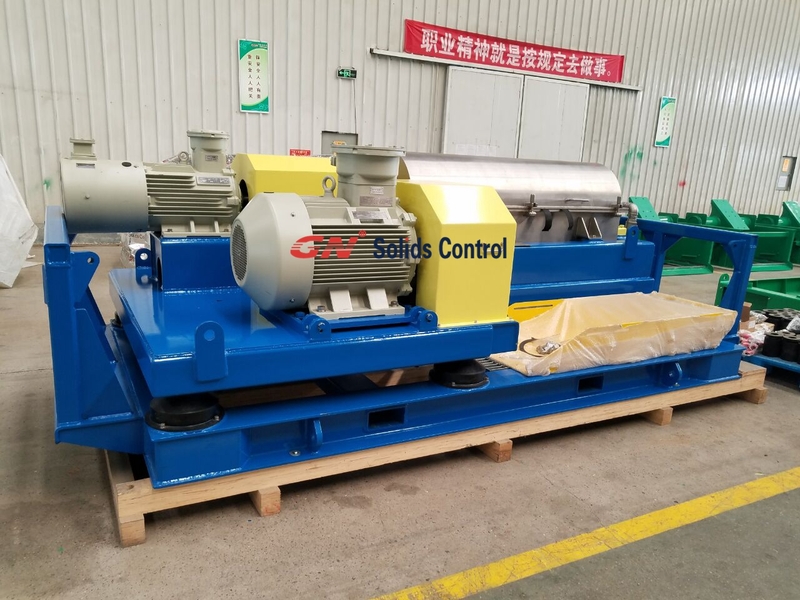 GN solids control will ship 2 units of VFD decanter centrifuge to India drilling company next week. They are for ONGC project. GN provide all the documents and parameters as per the tender requirement and finally got the tender. The ATEX certificate for positive pressurized VFD control panel and motors are installed with the GNLW453 decanter centrifuge are suitable for 460V/60HZ, 3 phase and for zone 1 application. The main components and the cabinet is imported from Europe by air. The centrifuge with offshore lifting pad, we can get DNV certificate if required by the client. The centrifuge painting color is customized by the client. We choose screw pump as the centrifuge feeding pump, the motor is also ATEX certified 460V/60HZ, 3 phase for zone 1 application, the flow rate can be adjusted by the VFD converter by control the frequency. Centrifugal pump and submersible slurry pump can be also used as feeding pump of decanter centrifuge, but they are not effective to control the frequency to adjust the flow rate, we suggest to use valve to control the flow rate. The decanter centrifuge is high configuration decanter centrifuge, the screw is protected by tungsten carbide tiles, the solids discharge port and fluids distribution port are all protected by tungsten alloy, and the whole screw is made of stainless steel, the centrifuge bowl is made of duplex stainless steel 2304 by centrifugal casting. The client can make the telescopic skid or mud tank locally to save transportation cost. We will provide dimension drawing, installation drawing and other necessary technical information so the client can install the equipments properly at site. GN decanter centrifuge is widely used for drilling rig solids control system, drilling waste management system, dewatering system, industry waste water treatment, oil sludge separation system, welcome to contact with us.